Time: Friday afternoons, 12:30 to 1:30 pm. Location: Room B151, SPPH Building, 2206 East Mall, Vancouver, B.C. 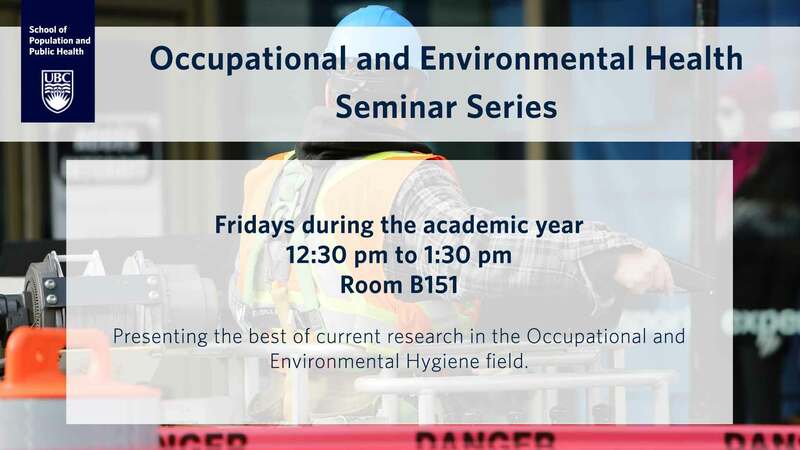 The best of current research in the Occupational and Environmental Hygiene (OEH) field is presented at these seminars, which run weekly during the academic year. Attendance is mandatory for MSc OEH students. You are welcome to join us online via Adobe Connect. Please see below for technical information about this process. View Certification Maintenance Points information. Presentations may contain provisional unpublished information and must NOT be distributed without explicit permission of the presenter. Please visit this Adobe page to ensure system requirements are compatible between your device (desktop computer or mobile device) and Adobe Connect. You will be able to view the presentation, hear the presenter, as well as text-chat with the seminar assistants in the chat box at the bottom of the screen. You will not be able to ask verbal questions. If you have a question for the presenter, please type it into the chat screen and it will be read aloud during the Q&A portion of the seminar. We cannot diagnose remote technical issues on the day of the seminar. However, we are happy to confer with you or your IT support staff regarding our configuration ahead of time. Please contact spph.it@ubc.ca at least three business days before the next seminar. Adobe Connect Technical Support: on-line or by phone 1-800-422-3623.